These mocha and tutti frutti cream horns are Paul's interpretation of the signature challenge in the Patisserie episode of Season 3 of The Great British Baking Show. It is explained in further detail by Paul in Masterclass: Part 4. For the puff pastry, put the flours, salt, eggs and 100ml (3½fl oz) cold water into a large bowl and gently mix to an even dough using your fingers. Transfer the dough to a lightly floured surface and knead it for 5-10 minutes until smooth. The dough should feel a little tight at this stage. Shape the dough into a ball and put it into a plastic bag in the fridge to chill overnight, or for at least 7 hours. Flatten the butter into a rectangle, about 16x7½in, by hitting it with a rolling pin (you may find it easier if you sandwich the butter between 2 sheets of cling film). Return to the fridge for an hour to harden the butter again. Roll out your dough to a rectangle, about 24x8in wide. Put the butter on the dough so it covers the bottom two-thirds. Make sure that it is positioned neatly and covers almost to the edges. Lift the exposed dough at the top and fold it down over half of the butter, then fold the butter-covered bottom half of the dough up over the top. You will now have a sandwich of two layers of butter and three of dough. Pinch the edges together to seal. Put it back in a plastic bag and chill for 1 hour. Take the dough out of the bag and put it on a lightly floured surface with a short edge towards you. Roll out to a rectangle as before, keeping the edges as neat as possible. Fold the top quarter down and the bottom quarter up so they meet neatly in the centre. Then fold the dough in half along the centre line. This is called a book turn. Chill in the bag for 1 hour. Take the dough out of the bag, put it on a lightly floured surface with the short end towards you and roll into a rectangle as before. This time, fold down one-third of the dough and then fold up the bottom third to make a neat square. This is called a single turn. Chill in the bag for another hour. Bring the dough out again and do a single turn as previously. Chill in the bag overnight. For the mocha crème pâtissière, melt half of the chocolate in a heatproof bowl set over a pan of simmering water. Pour the milk into a saucepan and bring to the boil, then remove from the heat. Whisk the sugar, egg yolks and cornflour together in a large bowl. Pour a little of the hot milk onto the egg mixture, whisking continuously. Whisk in the rest of the hot milk until well-combined, whisking all the time. Return the mixture to the pan and cook over a gentle heat, stirring continuously, until the mixture becomes thick. Remove from the heat and pass the mixture through a sieve into a clean bowl. Add the melted chocolate and coffee extract and stir until thoroughly combined. Cover the surface with cling film to prevent a skin forming and chill thoroughly before using. For the tutti frutti filling, whip the cream and limoncello until soft peaks form when the whisk is removed. Fold in the ricotta and chopped peel. Cover with clingfilm and chill before using. 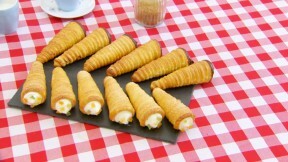 For the cream horns, line a baking tray with non-stick baking paper. Preheat the oven to 375F. Roll the dough out onto a lightly floured work surface until its longest edge is 24in long. Cut the pastry into long strips ½in wide. Starting at the pointed end of a cream horn mould, wrap a pastry strip around the mould in a spiral, with each line overlapping slightly. Place on the baking tray. Repeat to cover all 12 moulds. Brush all the pastry horns with egg wash and sprinkle with sugar. Bake in the oven for 12-15 minutes, or until the horns are golden-brown, crisp and the pastry risen. Transfer to a wire rack to cool completely. Once cool, carefully remove the moulds. To assemble, melt the remaining plain chocolate in a heatproof bowl set over a pan of simmering water and dip the wide end of 6 of the cream horns in it. Leave to set. Spoon the chilled mocha crème pâtissière into a piping bag fitted with a star nozzle and use to fill the chocolate dipped cream horns. Spoon the tutti frutti filling into a piping bag fitted with a plain nozzle and use to fill the 6 remaining cream horns. Decorate with chopped candied peel. Serve immediately. Note: This recipe contains U.K. measurements and may require conversions to U.S. measurements. It has also not been professionally tested.